Yellowstone Bison "Don't Mess With Me"
In September 2001, my best friend, Randy Reeves, asked me to join him on a moose hunting trip to Idaho. He had drawn a rare out-of-state tag in the Targhee National Forest. He would need some help if he got one down and you don't turn down best friends and so I agreed. We were to fly to Salt Lake City, rent a truck and stay in another friend's cabin in West Yellowstone, Montana. I planned to visit Yellowstone NP since we would be there at least a week. I packed my two Nikon film cameras, 500mm lens, 300mm lens, 24mm lens and nifty 50mm lens tripod and 30 rolls of Fuji Provia and Fuji Velvia color slide film. Everything fit into a Lowepro roller bag and I would carry this onto the aircraft. Everything change on the 11th, 9-11. I remember being in the Homicide offices discussing a case with three other detectives and someone mentioned that a plane just hit the World Trade Center in New York. None of us believed it so everyone, about 25 detectives gathered around a small tv in the break room and watched as our concept of safety just evaporated. As a result all flights had been cancelled. Randy called and said our flight had been cancelled so he said let's drive. It's not every day you draw a tag for Idaho. I had a much needed vacation, and I was allowed to go, so we headed to West Yellowstone in his pickup truck. To make a long story short, Randy hunted alone and got his moose. I rented a car and I stayed in touch with him via cell phone and joined him in the Targhee National Forest and helped him with the moose. ( I won't go into details here.) We found a game processor, and left it with him. We would stay another five days as Randy accompanied me and we explored Yellowstone NP. Yellowstone has the largest herd of bison in the world. You can judge a bison's mood by its tail. 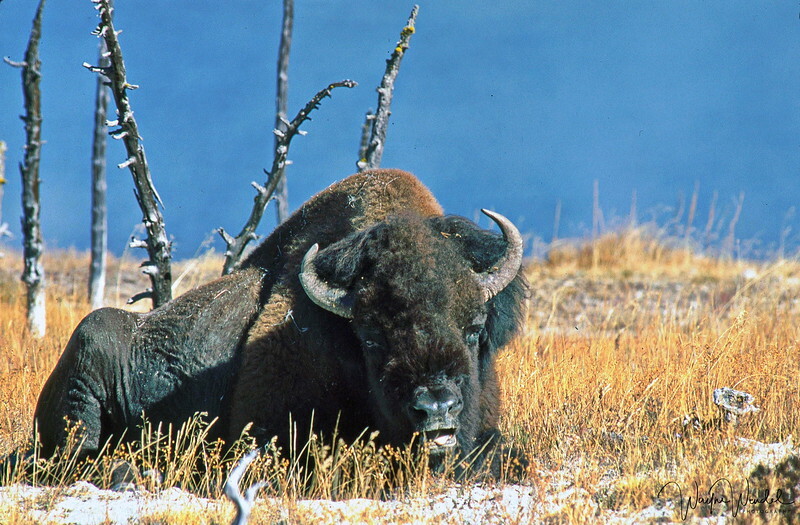 When it hangs down and switches naturally, the bison is usually calm. If the tail is standing straight up, watch out! Bison are the largest animal in North America and they are also fast. They can run 35 mph, faster than most humans. Bison have injured more people in Yellowstone than any other animal and I just don't trust ANY wild animal. I took this photo with a Nikon N90s loaded with Fuji Provia slide film and a Nikkor 500mm f/4 lens. I can tell you the f-stop was probably f/4 at 1/250 second on the 100 ASA film. I was on a boardwalk near one of the many geysers in Yellowstone. Thank you for your comments, suggestions, critiques. It's one of the best features of Smugmug. Thanks for sharing your story. My job required me to travel all over the country and sometimes internationally for about 30 years. When 9-11 happened by the grace of God I was not traveling, but many of my colleagues were. Like you, I was in my office that morning and one of my staff members came to tell me (we were the only two there at the time). We had one of the larger conference rooms and a tv on our floor and we gathered to watch. As the morning went on, the conf. room was very crowded. Great story of the trip. Yellowstone is magnificent! We were there about 5 years ago. Fantastic capture. That's a "BIGGIE -SIZED" Bison! WOW! Love the story. Ditto, Terry, this came out awesome. Beautiful capture. Great story and excellent film shot; what scanner did you use?